In the early 90s, Hollywood introduced the public to cyberspace — a thing where you fly around inside colorful 3D graphics. Hacking something is as easy as manipulating some abstract 3D shapes, but be careful: a virus can kill you for real. A lot of these tropes are still going strong today, and it all goes back to that mad little string of cyber-movies including Johnny Mnemonic, Hackers, and Lawnmower man. Pretty much, Hollywood wanted to make movies about computers, and then discovered that real computers were actually very dull, non-actiony things. So, they took the bits they liked, and made up the rest. These stereoscopic goggles are one of the real things Hollywood liked enough to keep. Each lens is actually an LCD, with a resolution of exactly one (1) pixel. The LCD is either clear, and you can see through the lens, or black, and you cannot. The goggles alternate between blocking out the left eye and the right eye. It’s time-synced to a computer screen so the computer can show you an entirely different image for each eye. Thus, the brain can be fooled into thinking something is a 3D object, in the same way a rapid series of still pictures becomes a movie. The result is what people are now calling “augmented reality” — you see the 3D stuff floating in front of your monitor, just as the promotional literature implies. 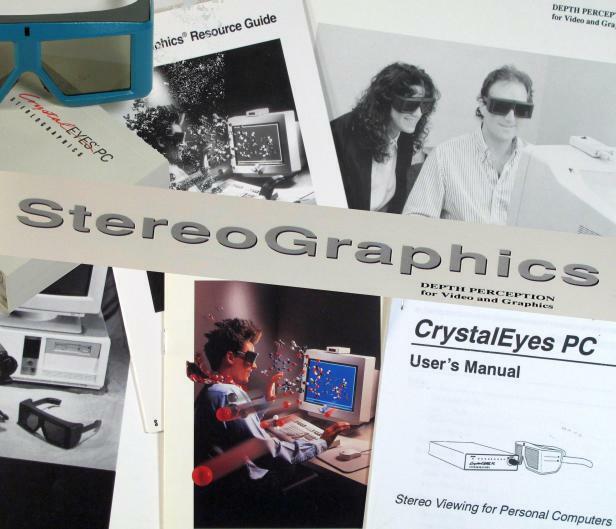 On the subject of the promotional literature — the company, StereoGraphics Inc., mostly sold these goggles to research labs that wanted to see pictures of floating molecules and protein chains. So, obviously, this is represented in the promotional pamphlet — bit it’s still marketing, darn it, so they had to jazz it up somehow. And thus, you have a bit of graphic design that looks exactly like something from one of those movies — except it was a real product, and they were totally serious. In theory, these goggles are totally operational, and can be used with any setup that can meet their timing and I/O requirements. The sync box gets its timing off of the VGA signal, passthru style — You connect your VGA port to the sync box, then plug your monitor into the sync box. In practice, it requires a 120hz refresh rate (60hz times two eyes) and it’s rare you see an LCD go over 70hz. Thus, while the sync would probably work, the monitor wouldn’t be able to keep up. CrystalEyes is still being manufactured and sold by a company called RealD, and it’s possible (but unlikely) one of their newer emitters will work with these goggles. However, You’ll have to ask them about that. Bottom line: This is mostly a conversation piece, but someone who understands the nitty-gritty of VGA signals could probably get it going. The man that invented these goggles and founded StereoGraphics (Lenny Lipton) also wrote the lyrics to the song Puff The Magic Dragon. If it weren’t true, you’d never believe it. 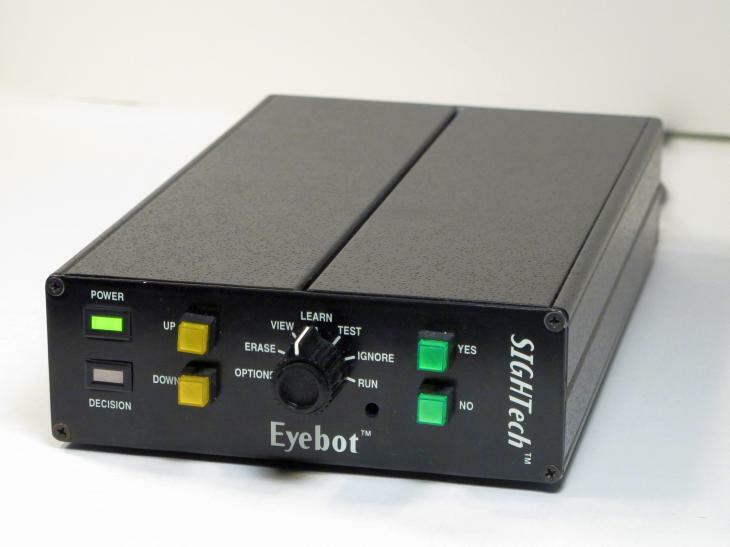 For Sale: Sightech Eyebot 1.00 Rev E.
Sightech’s devices are special because they are self-learning; in other words, there is no programming required! A manufacturer simply has to show our devices good parts, thereby teaching it what is acceptable. After a couple of minutes (or seconds) of training, our devices will then be able to detect if a part is good or not. In short, Sightech’s products are embodied with artificial intelligence called Neuro-RAM tm. Sightech’s devices will learn whatever you show it. Size does not matter: Sightech’s devices can learn atoms or galaxies; they’ve learned fruit and even human faces. Ultimately, Sightech believes its technology could be used in robotic navigation, picking fruit from trees, or identifying a face in a crowd. Sightech believes it will deliver the enabling technology for widespread use of robots in the 21st century. Management had no further doubt after that, because management understands vision. Pretty much, you can train the Eyebot to recognize patterns + objects off a camera’s video feed. When it spots the pattern or object you trained it to spot, it performs an action you designated, i.e. send a 5v pulse out the TTL outputs ’round back, which fires off a servo, etc etc…. Example application: A Eyebot-targeted, servo-driven, squirrel-squirting auto super-soaker. One would simply train the Eyebot to recognize squirrels entering the target zone, then connect the Eyebot’s output to the trigger servo, and…. SQUIRREL RECOGNIZED! ACTIVATE SERVO! SQUIRT! High-speed camera captures the results. After three weeks, the amount of accumulated footage should be sufficient for a viral youtube video centered around squirrel aquatics. When our auction terms say this box works, we merely mean that it functions within specifications as laid out by the manufacturer. As for the deeper, more philosophical interpretation of “Does it work?” That is, “Does it do the job it claims it can do?” Well… sorta. To study this question, Riced Out Industries requisitioned four argumentative grad students, and let them free-run. Upon halting, their conclusion was 0.62. Management complained that this was not a proper answer, and demanded an explanation. The students explained that you can’t issue a pass/fail to a system built on fuzzy logic. Not particularly well, no. It can work if you control the lighting and never ever alter the camera position, but it doesn’t always… and, more to the point, most people can’t do either of those things (fixed lighting and a camera that doesn’t move around, even a little). Additionally, machine vision is, like, an immensely hard subject that’s difficult to scotchguard for the plebs. If we clarify that IT will be using the Eyebot, and not grandma, then you’re at least in the ballpark. Also, to its defense, this is late 90’s tech, and it’s pretty darn good for late 90’s tech. It’s a heck of a lot of fun to play around with, even if it can’t recognize much of anything reliably. It has some neat video filters, and a general sort of RoboCop aesthetic we find delightful. We will try to get a video demo up, schedule permitting. To Riced Out Industries, the ideal customer for this item would be a bored engineer with a burning desire to automate something involving squirrels. If you are such a customer, please inquire about a discount.